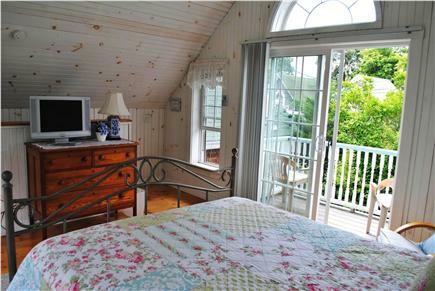 Sweet Pea is a charming gingerbread cottage in the heart of Oak Bluffs. 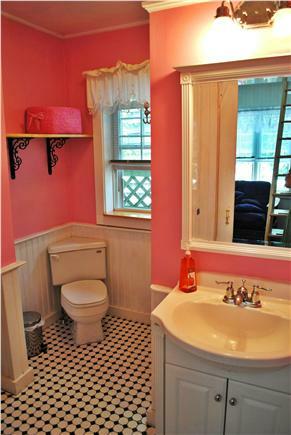 It's very close to a beautiful ocean beach (a block and a half) and also town amenities. This special little cottage comfortably sleeps two people. The lower level is an open kitchen/living space. 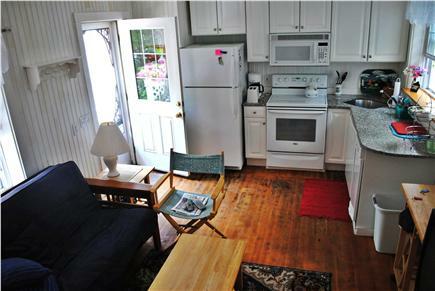 The kitchen has granite counter tops, dishwasher, trash compacter, and smooth top stove with microwave hood. In the living room area there's a futon. The bathroom and washer/dryer are also on the main level. 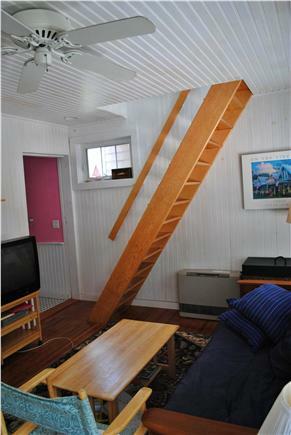 Air conditioning throughout the cottage makes for a cool summer stay. Climb a loft-style staircase to the second level and find an open, airy bedroom with a queen size bed. Open the slider, and you're standing on a small balcony. It's just perfect for enjoying morning coffee or an evening glass of wine. 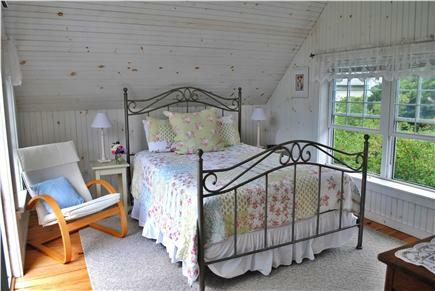 Although Sweet Pea's in the heart of historic Oak Bluffs, the location is quite secluded and private. When you leave the cottage, a five minute stroll will take you to the beach, a good grocery store, bakery, restaurants, lovely shops, bike and boat rentals, and public transportation to all points on the island. It's a most comfortable and convenient accommodation! Spring and Fall are beautiful seasons for an island getaway. Sweet Pea is heated to so guests will be cozy and happy on the coolest day or evening of the year. Additional availability info: Sweet Pea is available on a weekly basis (Sat. to Sat.) from May through October. This is a Saturday to Saturday vacation rental. Additional pricing info: Rates range 1650. TO 1950. Discount for multiple weeks. State and local taxes of 11.7% will apply. Beautiful cottage - relaxed and cozy. Enjoyed the movies/DVD's. Everything was just beautiful. Carol and Roger stopped by to say hello, which was lovely. We will be back for longer in 2019. Thank you! Had fun exploring Oak Bluffs, playing Frisbee in Ocean Park, and people watching from this perfect location. Can't wait to come back! Thank you Carol and Roger! We came for our godson's wedding. Lots of sight seeing and shopping. We had our fill of lobster! Sweet Pea Cottage was more than we could have even hoped for. It was so clean and cozy and, from the cottage, it was just a short walk to everything, including the beach. You thought of every detail to make our stay special. Thank you! We will be back! Beach days! Breakfast at Art Cliff Diner, running in the rain, hanging out with friends, drinking lavender ice tea! Awesome cottage - will stay again! Sweet Pea Cottage was so nice! We really didn't want to leave it. We spent a lot of time just reading on the deck and we loved the movie/DVD selection left in the cottage! This place feels like home. Tyson proposed on the beach and we hope to make a habit of coming here for our anniversaries. Thank you for this slice of heaven! Carol and Roger, we had a wonderful long weekend at your cottage. We are newbies to MV and really enjoyed all it had to offer. Sweet Pea was a great place to spend our fifth wedding anniversary. Thanks so much! Sweet Pea Cottage was the perfect spot for our fifth anniversary. September is beautiful on the Vineyard. Oak Bluffs was still busy but not so crowded as in the summer months. Sweet Pea was a perfect home base to explore the island by bus. We were only here a shot time but saw Edgartown and Menemsha, The sunset and seafood in Menemsha are to die for! Thanks Carol and Roger – we intend to come back soon! Carol and Roger, we had a wonderful time in Oak Bluffs ad at the Sweet Pea Cottage! The cottage was absolutely gorgeous and in a great location. It was everything we had hoped for and even more! We will definitely return next year. Thank you so much for opening up your home to us. We had a lovely week at Sweet Pea. It was my husband’s first trip to the Vineyard and he loved the convenience of being able to walk to town every morning to enjoy breakfast at Biscuits! My son was easily able to meet with friends on Circuit Avenue. We look forward to being able to come back to Sweet Pea next year! Sweet Pea Cottage has been owned by Carol and Roger Stewart since 1984. 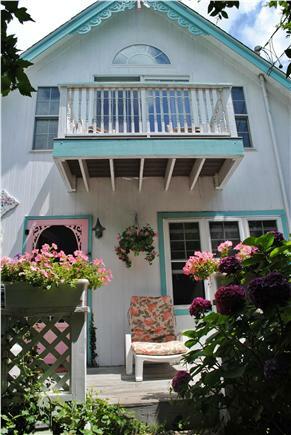 It sits next door to its big sister cottage, The Petunia Patch on Narragansett Avenue in Oak Bluffs. Sweet Pea has hosted many wonderful people over the past years, including many honeymooners and guests celebrating their special anniversaries! It's a lovely little accommodation and in a perfect setting - very close to both the beach and all town amenities including shops, restaurants, bike rentals, grocery store, bakery and much more. Public transportation is close by, if exploration of the island is for you! A stay at Sweet Pea Cottage will transport you back to a happier time when life by the sea was all about enjoying the simple pleasures of summer - swimming, relaxing walks, sitting on the porch and chatting. 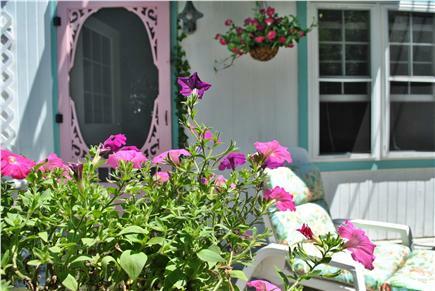 Sweet Pea is situated in the historic heart of Oak Bluffs, amidst many beautiful Victorian era properties. 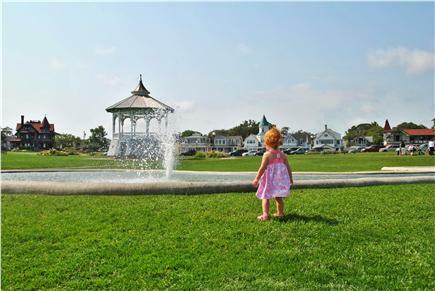 Oak Bluffs, also known as Cottage City, has a rich history. As you stroll through the Methodist Campground or take a ride on the historic Flying Horses Carousel, you'll being to appreciate all this lovely town has to offer. There are many restaurants in Oak Bluffs and if you walk down by the harbor to see the beautiful boats, you can enjoy sushi, fried clams, a lobster roll, chowder or delicious ice cream! Oak Bluffs is an interesting and fun place to vacation!